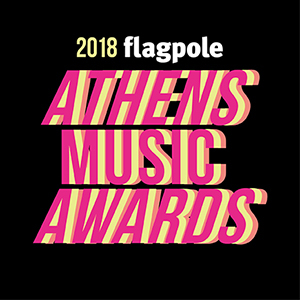 2018 Flagpole Athens Music Awards Ballot! The annual Flagpole Music Awards Show is designed to honor and celebrate those who make Athens, GA a center of musical creativity, enjoyment & accomplishment. Each year, Music Editor Gabe Vodicka convenes a panel of Athens-music experts, including journalists, promoters, producers and others, to determine a list of nominees for the Flagpole Athens Music Awards. This list represents the local musicians who those judges felt were most active and influential, and whose output was most compelling, during the period of May 2017–April 2018. Don’t agree with our choices in a particular category? Feel free to write in your favorite artist! (If you choose to write-in, be sure to also check the box next to it). Winners, as determined by reader vote, will be revealed on Thursday, June 21 at the historic Morton Theatre. The show kicks off AthFest, Athens’ annual music and arts festival. • Only one vote per person will be counted. • Bands are only eligible to win if at least 51% of votes come from the Athens area. Tunabunny - PCP Presents Alice in Wonderland Jr.
All fields below are required or your ballot will not be counted!